Christopher Nolan’s latest is his attempt to make a science fiction film of meaning, a 2001 for this generation perhaps, with life on earth reaching its end due to overpopulation and humanity needing to find a new home. Matthew McConaughey plays a former pilot who leads the way with a small group of scientists, leaving behind his beloved daughter; when she grows up she resents this but ends up working for the remnants of NASA just as her father did. 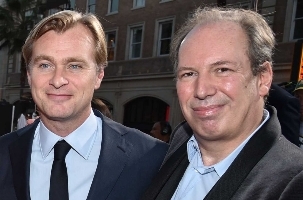 This relationship – what it means to be a father, to sacrifice so much for your daughter – was the hook with which Nolan got composer Hans Zimmer, who initially wrote a bit of music based on that idea without knowing what the movie was about. (And by the way – since the movie was released two weeks ago and my own daughter was born two weeks ago, I haven’t seen it – so I’m afraid I can’t talk about it here, but only review the music on its own terms.) Everybody knows this, because for the last few weeks it’s been impossible to leave the house to go to the supermarket without falling over Zimmer being interviewed by somebody or other, explaining how revolutionary it all is. I don’t ever remember another film composer doing so much PR for one score before – it wouldn’t be a surprise to see a photo of him with a “GIVE ME AN OSCAR NOW” tattoo across his forehead any time now – and there’s been such an excess of bluster in all those interviews, there’s a danger it (and the rather irritating way the music has been released to the public – more on that later) creates a sour feeling about the music even if you’ve never heard it – it couldn’t possibly live up to the billing it has been given, and it really isn’t unlike anything we’ve heard before, and it really doesn’t push musicians to the boundaries of their capabilities – and that’s such a shame because actually the music is more than capable of speaking for itself. It’s one of the most impressive creations of Zimmer’s career and that central idea – that father-daughter bond – seems to have inspired him to create something unusually personal and about which he is understandably proud. The influences on the music seem to range from the 2001 connection (some textures here are certainly reminiscent of Ligeti) to the more unexpected, with Philip Glass’s Koyaanisqatsi apparent at times – and even James Horner’s signature rumbling pianos. (One frequently cited influence is Ennio Morricone’s magnificent Mission to Mars, but I can entirely believe Zimmer’s claim to have never heard it because I can’t hear anything remotely like it.) But in the best film music tradition, Zimmer does something that Horner himself has done so often which is to take these influences and bring them together into something entirely his own – this is Hans Zimmer music through and through, an evolution in his sound for sure but it’s unmistakably his sound and I suspect is quickly going to become many other people’s sound, as happened in the past with Gladiator and Inception. The album’s opener is “Dreaming of the Crash”, the music itself gradually emerging over the sound of wind and rain. When the score’s main theme does make itself known, it’s revealed as a slow piece, quite grandiose and as the score’s signature sound – the organ – pushes forth it takes on what sounds to me like a religious (specifically Christian) sound. I don’t know if that was intentional – indeed, I suspect it wasn’t – but so ingrained is the sound of the organ with the sound of the church, I suspect many will make that same association. More obviously, that familial bond that runs through the score is very obviously felt. The organ remains at the fore in “Cornfield Chase”, assuming here a spectral quality, the composer pulling out all the stops (forgive the pun) and creating a dazzling fantasy of a cue, dancing and shining and moving. “Dust” is another fascinating cue, a starker string melody – in the piercing highest register – accompanied by undulating rhythms, like waves lapping their way ashore, then a more urgent, up-front melody (the organ is back, accompanied this time by lower-register strings) not a million miles from some of the composer’s Angels and Demons take on 80s electronica. That dies down again, leaving dark electronics, a rumbling piano. “Day One” begins with a softer piano arrangement of the main theme, later the strings start soaring, the organ returns; and this leads into the score’s most sublime piece, “Stay”. It’s Zimmer’s brand of minimalism – maybe not in the strictest sense, but certainly in spirit – with a little melodic cluster being fed between winds, organ, a distant choir, later the brass section, sounds of nature accompanying it, the piece becoming more and more intense as it progresses to its stunning organ crescendo conclusion. Subtle it isn’t – subtlety is not a word one would associate with this composer – and nor is it complex. In fact it is from its very simplicity, its direct approach that its power comes – it is so obviously from the heart, so extraordinarily vivid and done with such grandeur and indeed gusto, it’s really quite breathtaking. I hope its power isn’t diminished somewhat in the years to come by trailer music hacks and lesser film composers incessantly copying it (as happened with The Thin Red Line‘s “Journey to the Line” and Inception‘s HORN OF DOOM) and that the piece is allowed to live on for a while as the heart and soul of Interstellar. A couple of much briefer pieces follow – the pared-down “Message From Home” with its piano version of the main theme, and ominous histrionics in “The Wormhole” – then is the fantastic “Mountains”, low-key rumblings accompanied by col legno violins (I think! – it’s important to remember that I’m an idiot) at precisely 60 beats a minute, brilliantly conveying the passage of time, in the first half and a veritable explosion of sound in the second. “Afraid of Time” is a more low-key piece, ditto “A Place Among the Stars”, though there’s a real tension brewing in the latter, more grand gestures beginning to emerge as the piece progresses but darker ones this time, leading perfectly into a jabbing piano introducing “Running Out”. “I’m Going Home” returns to the territory of the first part of the earlier “Dust”, slightly eerie, celestial textures shimmering away somewhat mysteriously; I love it, particularly the way it evolves into perfectly peaceful sounds later on. Another of the score’s standouts follows, the longest cue, “Coward”, a slow-burner of an action track whose rather humble beginnings lead into another of those organ setpieces, half Philip Glass and half Kraftwerk, contrasted with a delicate piano line that works beautifully in tandem. In the cue’s second half, things have developed into an absolute cacophony, piano and organ going neck-and-neck. It’s intense, maybe it is too overbearing for some; I am seriously impressed. “Detach” is even better, going for the emotional jugular in the same way as “Stay” did earlier on the album, adding in the ticking-clock col legno effect, and this time not starting small and getting big but starting big and getting bigger. “S.T.A.Y.” is another piece of minimalism, a simple pattern rocking back and forth, a sense of perpetual motion. “Where We’re Going” is a nice finale, cleverly suggesting an adventure just beginning rather than one ending, returning the score to where it began, completing the circle. If you buy the regular CD from a record shop, then that’s where the music ends. The good news is that as an album it’s a wonderful listening experience, and there’s no sense of there being anything missing from it. But there’s also the digital version of the album, which features all that and (currently) eight additional tracks, including one that wasn’t initially there but was later added. And there’s another single track available only to those Americans who bought their tickets for the movie from a certain website. And coming soon is a super-deluxe album with yet more music on it not available on the other versions. It strikes me that this is a particularly cynical way of releasing a soundtrack – people want to have it quickly, so they buy the regular edition, whether in physical or digital form. Then an extra track is unexpectedly added to the digital one, so those who bought it early now have to spend more money on getting another track. Then there’s another track which they didn’t know about which can only be (legally) obtained from a rather obscure source. And they’re buying all this knowing full well that they’re going to have to then spend a small fortune on the super-duper edition a few weeks down the line, most of the music on which they’ve already bought. Seriously unimpressive and it strikes me that it’s a mechanism of releasing music that virtually begs people who want to hear it to download it illegally rather than jump through all the hoops and spend money several times in order to get everything they want legally. Maybe I’ve missed the point, but I really hope it’s not a sign of things to come. Anyway, I decided to stick to reviewing the regular album and like I said, the good news is that as a standalone album it’s absolutely fine. Hans Zimmer’s a continually controversial figure, not just because of his music but the ridiculous bluster of his statements in a seemingly never-ending stream of promotional interviews and, recently, rather eccentric behaviour on social media. That makes it very important to separate the music from the man and for me, there’s never been any doubt that when he’s really on top form, he is a game-changing figure in film music, leading the way that others inevitably follow. Interstellar marks the next step of his creative journey and is up there in his top tier of music along with The Thin Red Line and Inception. It is music of grand gestures but with an intimate heart – clearly music written of the soul. Most music is created from love, but film music is of course a job – and you can hear when the composer’s heart isn’t really in it. Likewise you can hear when a composer is so taken with a film he or she just reaches a special place, and that’s the case with Interstellar. Its lack of subtlety and its emphatic grandeur from moment one makes me wonder how it could function as a film score that doesn’t overwhelm its film by treating everything as being so important – and I’ll have to wait a while to be able to experience it for myself in that way – but the album lives perfectly well without the film. It has the sense of being special all the way through, creative and dazzling, big and bold and brash and reveling in drawing attention to that. This is an excellent review. It’s a thrill to hear a great score from Zimmer after so many years of disappointment. Want to bet you’ll still be labelled a Zimmer hater if your next review of one of his scores is negative ? Anyway, can’t wait to hear this score. Organ + space is like catnip to me. “takes on what sounds to me like a religious (specifically Christian) sound. I don’t know if that was intentional – indeed, I suspect it wasn’t – but so ingrained is the sound of the organ with the sound of the church, I suspect many will make that same association.” This religious association is well founded; Christopher Nolan and Zimmer both thought made the association between religion and the great unknown, and incorporated that into the soundtrack using the ethereal organ. Nolan said something like “religion is our way of describing and explaining the vast abyss of space, and getting to grips with our place in it. In that sense, Interstellar asks very much the same questions, so that’s the route we took with its sound.” ‘Twas something along those lines. Apart from that, stellar review (pardon the pun)! Good to see the huge rating for another Zimmer/Nolan collaboration! What do you think about Zimmer’s chance for a Best Composer nomination James? Great review of a great score. Agree with you regards the problematic (unethical?) release. That super duper two-disc release still hasn’t got a tracklist yet, far as I know, and is so far only set for a release Stateside. Its like Zimmer is trying to encourage the illegal downloads of this score. No doubt Sony will (eventually) release a damn-near complete edition sometime next year but its all very messy, and the score deserved better. It also deserved a better movie, but never mind. Anyway, I’m still waiting for an expanded THIN RED LINE. ..
My gripe about the music AS HEARD IN THE FILM was that when combined with sound-effects [the high audio levels were compressed and then laid down on the sound track at ear-busting levels] the mix overwhelmed the senses AND made the dialogue inaudible. CHRISTOPHER NOLAN defended the criticism of his sound-mixing by saying it was done DELIBERATELY — to create an environment of REALITY?? Come on – Cinematic Reality is ‘contrived’ reality! We havn’t advanced enough technologically whereby our neurological, emotional & psychological responses can be so linked to those of the Screen Characters that WE BECOME THOSE CHARACTERS for a few hours. The problem of inaudible dialogue was compounded by actors mumbling & swallowing their words. Nolan [and his brother] wrote the script, so naturally he knew what the actors were meant to be saying. Thanks for such an expanded review James…I now look forward to hearing ZIMMER’S music that within the movie irritated me due to the director’s awful mixing. I wonder if Voters for the Academy Awards will grant INTERSTELLAR a ‘Best Sound Mixing’ nomination. And on a personal level James, I wish you LOTS OF JOY with your daughter. While the music works perfectly in the movie itself and I applaud the unconventional use of the organ in a blockbuster, I must say I’m not thrilled by it on album. Bach,Strauss,and all the other great composers didn’t repeat/looked back on their work ???? ?,think and listen again !! Andre, I think it’s less an issue of the mix and more an issue of some theaters not calibrating their sound systems correctly. I personally had no issue understanding any of the dialogue and thought the mix was great. A friend of mine who saw the movie twice at two different venues said the first time it was perfect and the second time atrocious. I’ve been seeing folks on social media being extremely divided over this issue, so it’s likely they’re actually having very different experiences. It’s possible Jens! – I viewed the film at a state-of-the-art multiplex, expecting my passion for SOUND to be satiated by the strategic callibration of music, sound-effects & dialogue. And just before the start of INTERSTELLAR, the DIGITAL LOGO played, revealing perfectly balanced audio emnating from various speakers in the theatre. However, problems can suddenly manifest! After reading James’ review I will order the score…but only after South Africa’s postal workers [they’ve just ended a 4 MONTH STRIKE] sort out mountains of accumulated mail, including 2 parcels of CDs that I ordered months ago. Jens, were you impressed with ZIMMER’S score- as heard in the movie and now, on the album release? Terrific review as usual, Mr. Southall. It’s just too unfortunate that this brilliant score had to be marred by so many external issues. Your comments on “Stay” and its future especially depressed me. Yeah, it’s incredibly inevitable and embarrassingly predictable. I can already imagine myself seeing one of the Batman v. Superman trailers featuring this gorgeous piece and ripping my hair out as the tedious influx of other film trailers immediately follow suit. Andre, I was extremely impressed with Zimmer’s score, one of his most accomplished works ever. It doesn’t represent a bold step into the future, as he’s claimed in interviews, but rather a return to the more avant-garde scoring style of years past. This is a great thing in my eyes. It was also wonderful seeing music so at the fore in a modern film. I really hope that Interstellar enables other composers to be more boldly experimental in future blockbusters, rather than becoming just another template to be copied. The review is fairly spot-on. I’m typically a bit of a Zimmer hater- I’ve found his soundtracks of the past decade or so to be a slew of simplistic, un-subtle works that lean way too much on ostinato- but mostly loved this one. While still in the absolute sense a bit repititious for my tastes I believe it both skillfully supports and blends with the conceptual and emotional foundation of the film better than a more complex soundtrack- it doesn’t compete too much with the powerful cinematography, but rather supports it. The interplay between organ, piano, string instruments and synthesized sound has many subtle shadings and eerie, ambiguous connections, such as the balance between the allure and inhospitability of both earth and the potential refuges from it that are visited. Definitely a case of Zimmer expanding his palate as Noland expands his own. Also just to add- Interstellar’s soundtrack really evokes the balance between the strength and poignancy of human connections, especially love, and how they are challenged by the fragility of human existence in a challenging and unforgiving physical universe. A lot of the good “subtle” soundtracks take a couple of listens to “grow” on me (I could say the same for a lot of Thomas Newman’s music). Interstellar is a good example- I was underwhelmed the first time I listened to it, but appreciated it far more the second time. I often think that Zimmer’s better music reminds me a bit of Jeremy Soule’s background music for the Elder Scrolls series (Morrowind, Oblivion, Skyrim). I remember Sony trying to take advantage of customers’ generosity on Star Wars: Attack of the Clones’s soundtrack and it rebounding on them, resulting in them going back to giving fans a good-value release for Revenge of the Sith, so hopefully the current trend with some of the high-profile modern soundtracks will similarly rebound. As good as this review is, I would like to know what James thinks of this score within the movie. The Interstellar score was played live to the film with Hans Zimmer leading (but not conducting) the orchestra at The Royal Albert Hall in London the other night. The venue is famous for its pipe organ which of course is necessary to play this score. Professor Stephen Hawking introduced a talk about the science of the film with Kip Thorne, Christopher Nolan, Professor Brian Cox and Hans Zimmer in attendance. Then Michael Caine introduced the film. It was a once in a lifetime event and absolutely incredible. An amazing experience for fans of the film and music. The docking sequence even received it’s own set of applause!